It was a slightly drunken promise but none the less it was an invitation to Africa. Taking advantage of an absent boss, stretching one weeks leave into two and just enough time to get jabbed, insured and booted. I was off to Ethiopia to meet the ramshackle doctors on their travels. 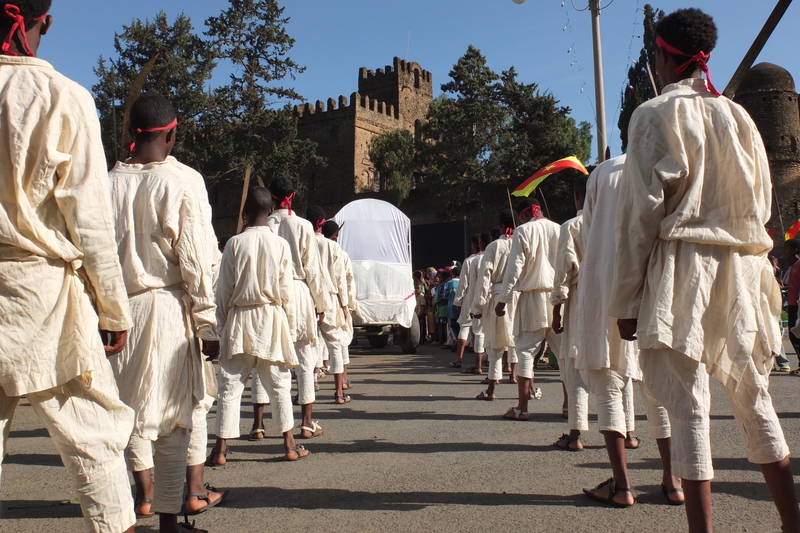 What an introduction, the Ethiopian Orthodox epiphany, where clerics and priests paraded, carrying enormous brass crosses, walking on carpets that are laid out in front of them and rolled up behind them as they passed. Where the girls tried to out do each other with amazing hair styles; three domes, big ‘fros or braids like tiaras over their foreheads, and where sewing white buttons on your shirt, skirts and hat seems to be a status symbol of sorts. Everyone was in the streets, floats depicting bible stories and groups chanting, clapping, singing and stick waving, bounding up the street in what to me seemed like unimaginable heat. Beautiful umbrellas, coffee that stretched your eyeballs, goats running riot, amazing birdlife and the beginning of a fried donut diet had started and all with people who’d left the UK months before. As an outsider from the core trio the Land Rover had become their home and as with any English or Welsh man it certainly was their castle. For me it was a holiday, two weeks to see, taste and walk things never seen before but for the Drs it was life, daily life in a different place every day, with always a bigger task at hand, not merely exploring but surviving and progressing towards Cape Town. 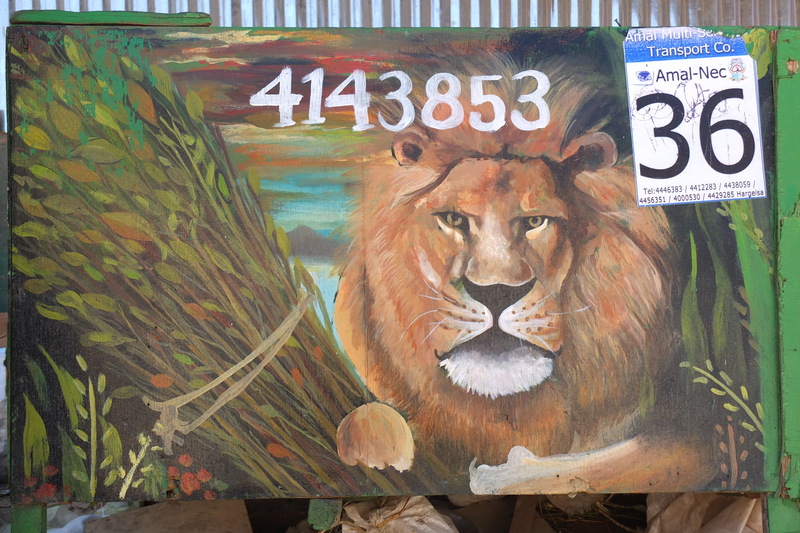 Sleeping on wooden boards in the back of the Landy, seeing the African Cup on the big screen – Ethiopia drew with Zambia! Visiting Gondar’s castle and experiencing some awesome Ethiopian shoulder dancing – a pretty tricky dance move that feels a lot like a parading cockerel – and then off, heading towards the mountains! 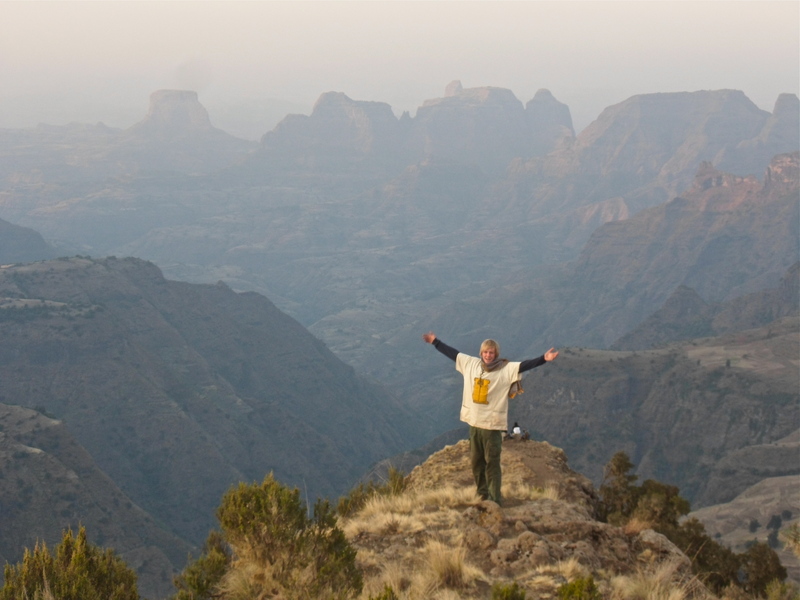 The Simien Mountains, worn by rivers the drops are enormous, huge plateaus between Jurassic looking mountains with level square summits unlike our European pointy peaks. Eagles flew overhead as we happily picked up our scout complete with AKA and trundled an hour and a half in the wrong direction. 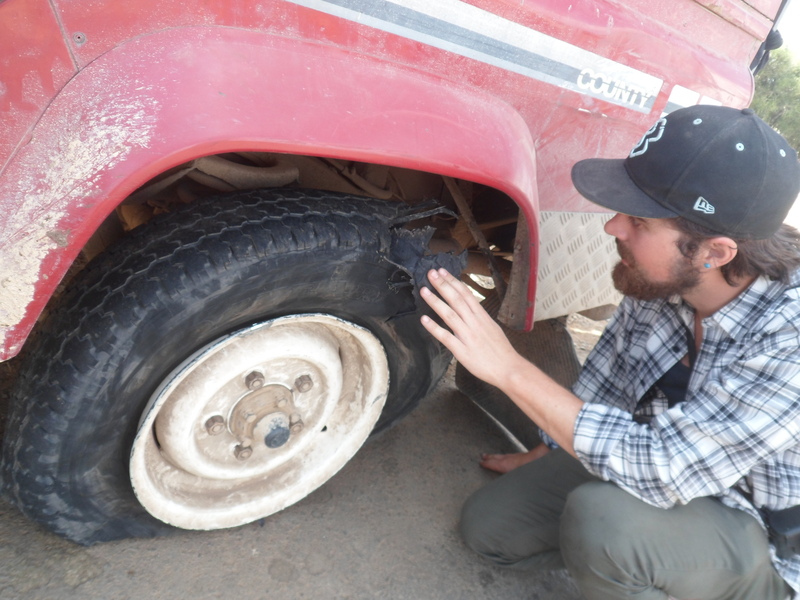 I will let Rich explain the intricacies of the punctures but needless to say with a woman on board the Landy started to sink, repeatedly, destroying many inner tubes and one tyre in spectacular fashion. Following a long day in the mountains, where five of us had been squashed in the land rover (3 in the party cabin, drives, navs and DJ), we had a bit of poetry, some warm beer and more stories of Bob’s bicycle travels. Joining up with the Swiss in the mountains for a starlit camp, peanut rice, guitar and harmonica twiddling and while our scout bundled himself under a bush for the night we had the luxury of a camp and early rise to watch the sun come over the valley. 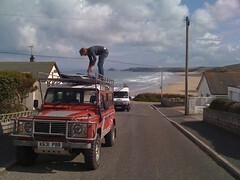 meeting some other Cornish adventurers. es, updated to include gun wielding prophets and fire enveloped devils. I turned the ripe old age of 27 and it was time for a singsong, bringing the Perraners to Ethiopia with shanties by candlelight and a spot of gin with malaria fighting tonic. 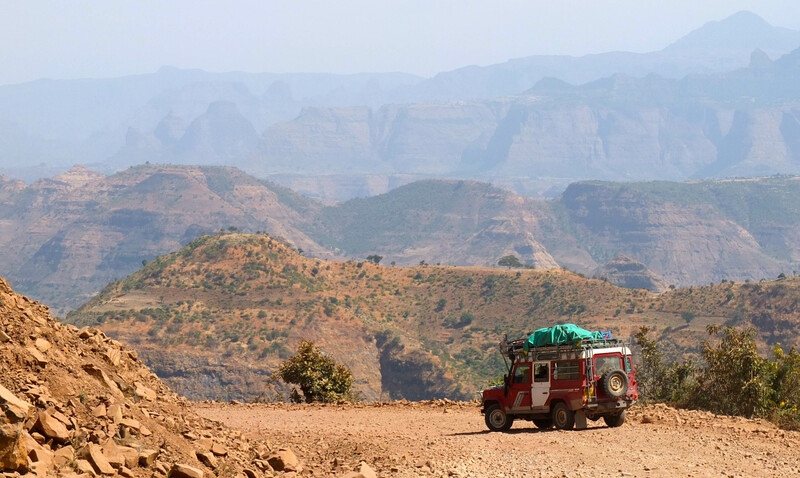 I won’t hog all the stories as we travelled onwards on a whistle stop tour to one of Ethiopia’s ‘must see highlights’ Lalibela. A few more bedbugs, stale bread and expedition marmalade helped us along our way as we viewed the largest rock hewn church in the world. Not wanting to build upwards Lalibela is famous for its churches carved down into the rock, so their roofs are at ground level and you descend in through Indiana Jones style tunnels, steps and nifty alleyways. It was hot, it was dusty and they’d just put the price up to European standards but you can’t really say no to the enormous St George’s cross church hewn into a hill and the cave like rooms where services were going on; humming with people, chanting, drums and frankincense. Despite our haste, we were still miles from Addis Ababa. They were having none of me travelling back to the capital without them so two days solid driving ensued through beautiful plains with African cattle, round huts and seas of green teff following along the rivers. We even crept away from civilisation for a sneaky hillside camp, lit only by one head-torch to avoid discovery, it was the most incredible starlit night I have ever seen, from the southern cross to the plough and the sharpest camel thorns I’ve ever had the misfortune to stand on. Then on to Addis and a cosmopolitan change, for the first hot shower of the fortnight and a bit more Italian inspired cuisine. The Orthodox Ethiopians have a lot of fasting, apparently to calm the high spirited highlanders and while no meat or fish twice a week was a bonus for vegi me, some may agree when choosing between spaghetti or traditional injera (fermented flour pancake), there may have been some advantages of the Italian invasions in the past. So enough of my ramblings, back in the UK for over a month the memory of the Landy and the bruises she inflicted seems too far away. Amazing, green, bouncy, dusty, hot, birdy, surrounding, bloody inquisitive, pen-demanding Ethiopia! To travel by plane is to step through a portal. As immersed as you become in your new surroundings, no matter how real it all seems, you can always step back, blinking and surprised at how easily you fall back into your old routine. Sitting in the same seat that I left the pinpoint familiarity of my parents’ driveway, the world has changed gradually around us. The scale of the ground we have covered makes the differences more understandable. Our car, our home has come with us. It is both a vessel for exploration and a retreat. After the hectic African towns and cities, to return secretly to the bush and set up a thorough, comfortable camp is the closest feeling I have to home. Back in Gondar, we met a few of our local friends to watch Ethiopia in the first round of the African Nations Cup. 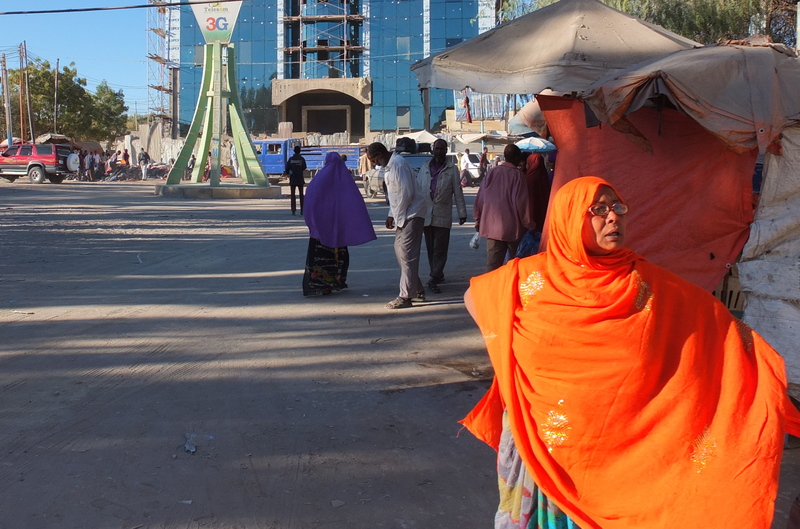 A screen was erected in the town centre and a large crowd gathered to watch Ethiopia’s first league appearance in thirty-one years. The opposition was Zambia, last year’s winners. I predicted a whitewash. The tense crowd seemed like the entire fate of the nation rested on the game. Ethiopia put on a good show against the favorites, getting them on the back foot with an early goal. However, Zambia fought back a draw. The crowd seemed disappointed at this bold debut. The game seemed to represent the optimism of this country, whose economy has grown at a rather unsustainable 10% in the last five years. It also seemed to represent its slightly unrealistic expectations. 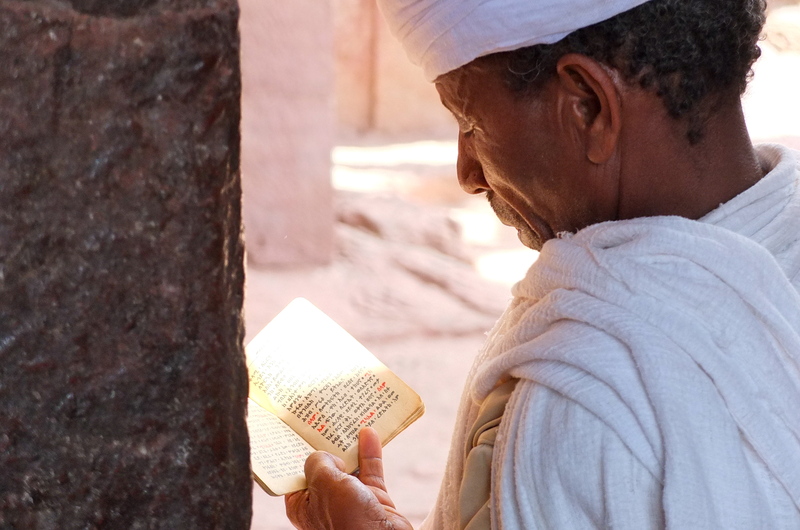 We wanted to cram in as much as possible whilst Megan was around, so we headed on to lake Tana and the city of Bahir Dar. Here, we would find the source of the Blue Nile. After fixing another puncture we had a goodbye lunch with Dr Asamere and set off on good roads. I remembered the highways being terrible only two years ago. Now the Chinese had moved in, leaving a network of smooth, thin tarmac in exchange for long-term mineral rights. These un-maintainable roads seemed destined to wash away in a few rainy seasons. We were three hours into a beautiful mountain cruise. I was driving around 50mph (any faster being unwise on the unpredictable roads). The midday sun had made the whole car sleepy as we listened to DJ Bob’s reggae selections. We were all awoken by a very loud bang. The car jumped and shuddered. I hit the brakes and slammed in a low gear but as I tested a left turn I felt the back of the car slide out. We had a rear left blow out. I stopped breaking and let the screaming engine slow us, before guiding us into the verge. Fortunately we had just finished a run of switchbacks and were on a gentler bend. When I eventually prized my hands from the wheel, they were shaking. We were on the edge of a village and crowd was already gathering. The tire was red-hot and shredded. A combination of rock-wear, heat and altitude had exploded it. We quickly changed the wheel and tenuously drove on. Any further tight corners were driven slowly, with the uneasy feeling that Tess might fail us. It was about time for a much-needed evening beer as we arrived under a canopy of grand trees, by a cool lake, in a place I vaguely remembered. I had been doing a bit of overland networking in the preceding days and there was, at an outdoor table, a group of six awaiting our arrival. Among them was Chris, a well spoken, ‘Our Man in Africa’ sort who was leaving the independent election monitor business and looking for prospects in Ethiopia. He had gone ahead of us from Gondar and, true to character, arranged a full social itinerary, ready and waiting. At the table we met Claire, who was following a similar route down to Cape Town, only solo and on a motorbike. We were bound to overlap each other on the road. We also met Pooja, an Indian fashion professor at the University of Bahir Dar. Over a boozy supper it was suggested that we all stay at hers, complete with a fridge full of beer, wine and a campfire. The following days were passed in ease at Pooja’s house. During the day we explored lake Tana, the source of the Blue Nile and the ancient island monasteries, each night we would sit up late, sing, drink and play the guitar. Indeed, romance may or may not have blossomed over those balmy nights but the protagonists (if they even exist) wish to remain anonymous. When it was finally time to go and our tires were fixed, we drove on to Lallibella, the Unesco site of the monolithic churches. We arrived just in time for a massive entry-fee price hike and another puncture, the cause this time being a nail. The churches, still active with hermits and holy men who largely go about their business, were built throughout the (European) middle ages. Dug out from existing caves or hewn from solid rock, they stand embellished with symbolism and filled with holy treasures. Rich, Dan and Megan explored the twenty odd churches the following day. Bob, who couldn’t justify the $50 entry and I, who had seen them before, had the fun of finding another tire repairman. Bob and I picked up the rest of the team, awe-struck and exhausted that afternoon and belted off toward Addis. Rich was serving his term as navigator, the most important decision making role in the car. He decided to cut a large corner off our route along a winding road that showed up on St’ Nav’ (full title: his all seeing, holiness St Navier of Slough). 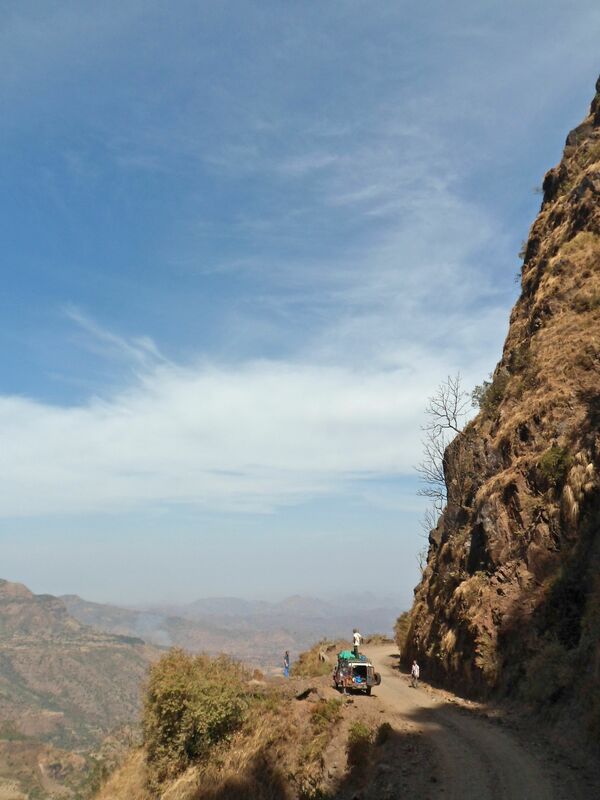 This way proved to be one of the most challenging pieces of off-roading in Ethiopia. With rock scrambles and riverbed crossings all the way up to join the mountain road. We averaged 12mph over 25 miles. One positive was that or Perspex rear window held its own as a well-aimed rock, hurled by a disgruntled villager upon realizing we hadn’t arrived to dole out money. The missile bounced inches from my face. The following days were road heavy. Megan, who had now assimilated seamlessly into the group as chief finder of un-findable things, had a flight to catch. We took the eastern road along the floor of the Great Rift Valley. Here in the shadow of the escarpment, Arabic culture had penetrated. Camels sloped alongside the road and minarets once again marked the towns. On the final day before Addis we made camp in a wild, hilly spot. Hidden in the thorns and blonde grass, the stars came out and we made merry (albeit quietly as you are never truly alone in Ethiopia). The Southern Cross was now making a regular appearance in the sky as we headed for the equator. Strangely though, clouds were beginning to obscure the night sky. The next morning something amazing happened; something that we had not witnessed since three months ago in Turkey. It rained. A cold air rushed up with the scent of damp earth. We watched the modest drops gather on our windscreen. It seemed strange and unfamiliar. We had accustomed ourselves to a dry and rainless world. We climbed back up to the mountain plateau, following the migrating clouds as they rushed up through the trees. Back at altitude the sun was still bright over gently rolling farmland and hills. Addis Abeba is not an ancient city like many in Ethiopia. In fact, it isn’t much like the rest of the country at all. It is almost as if somebody has dumped all the components of a modern city, tower blocks and all, haphazardly atop the fields surrounding a palace. That said, there are clusters of excellent bars and restaurants. It is also relatively safe. The young middle classes are really prominent in this fast-growing building site with the nightlife and live music scene is exceptional for Africa. We smashed through the gates of the Taitu hotel and made a show of parking up, for the tourists on the terrace. We had time for a shower, change of clothes before we headed out to a restaurant for Megan’s send-off meal. After a delicious if slightly rushed meal, we bundled her in to a taxi and waited for the phone call to say that she had missed her flight. It never came. The following days were a long slog around the spread-out conurbation, sorting out all the things we had been saving up. There were western travelers and ex-pats in an abundance that we had not experienced thus far. We met back up with Claire who was preparing to cross the treacherous Lake Turkano road into Kenya. This mammoth slog of tribe-land and empty wilderness would be madness alone, so she had recruited a convoy. They were heading off the next day to avoid the rains and the Kenyan elections. We were unable to travel with them, deciding to wait for the Swiss and chance the same route ten days later. Over lunch we met the other overlanders. 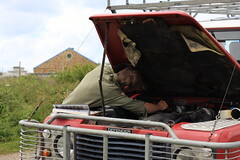 In a younger Defender, were two younger Brits, Walter and Freddy who were in the midst of a blown head-gasket fiasco. We also met three Germans in an immaculate Land Cruiser. On of them decided to travel in our car for a while before she headed back to Cairo. Her name was Estella. In an outdoor café where the live reggae blared out, we met Colin, a friend of the Khartoum French girls, world-class saxophonist and all round hero. We moved in with him. 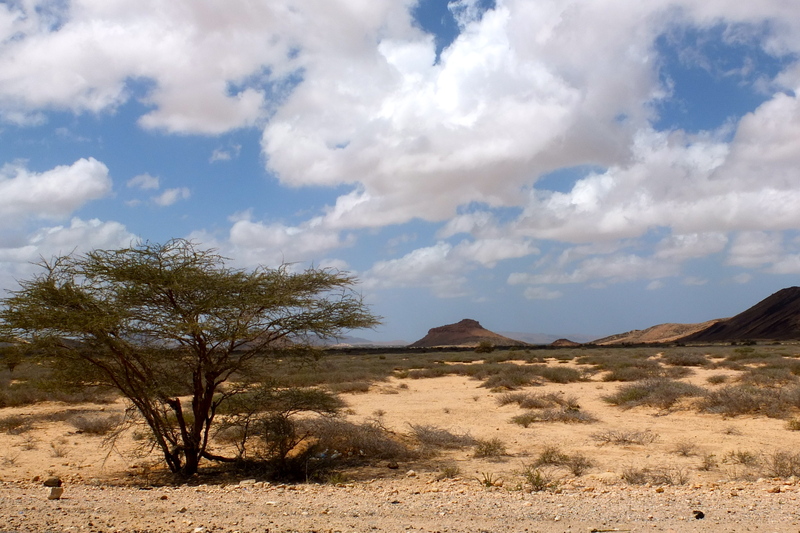 It was in Colin’s house that the newly formed group hatched a plan to visit the unrecognized republic of Somaliland. We had developed a bad habit of Samosas. These little bundles of food poisoning sit for an unknown length of time in shops, quietly incubating before a hungry traveller, looking for instant gratification decides to take a chance. Rich had taken ill. After a long, draining day of Timkat festivities, Rich was put to bed in the tent whilst Dan and I hit the town. We met our Swiss overland companions then picked up Bob. He had managed not only to cycle the long, mountainous journey from Khartoum, recover from the exhaustion, heat-stroke, injuries and illness but also to befriend half the Rastafarian community of Gondar. The streets of the city were alive and merry. We had found a local place, which sold beer at a negligible price and a popular dance bar. Ethiopia has opted out of the cultural influences of Europe and America that so much of Africa aspires to. Instead they have their own music, films and dances. * We made the bad decision of ordering food at the dance bar. During our two-hour wait for food, what had been a peaceful, sit-down restaurant erupted into a heaving nightclub. A live band blared out the ubiquitous rocksteady beat with wandering Casio trumpets and vocals that leapt across scales. The room filled with a blur of flamboyant uniforms and traditional dresses straight from the festival. All around, shoulders bobbed at a speed we were unable to replicate. The Ethiopian dance style represents courting birds of paradise, with men bouncing and puffing around women who shake their hair and shoulders. Through the maelstrom came a determined waiter with bowls of pasta held high. Squatting low on stools, we ate what we could beneath a thrusting canopy of dancers before a man dressed as a lime-green silk matador drunkenly flung himself across our table, scattering what was left. We abandoned our supper and entered the fray. The following morning, Rich awoke fully recovered from the grip of the Samosa bug. However Dan was now suffering the combined onslaught of food poisoning and a fiendish hangover. He wouldn’t leave the tent for several days. I was somewhere in between, hungover and tired from having spent most of the small hours explaining to a girl that a dance, regardless of its talented execution, does not mean marriage is inevitable. I was not exempt from driving to pick up our friend Megan, bright and early, from Gondar airport. Megan is so far the only person to brave the African leg of the expedition. An old school friend, Cornish resident and fellow Perraner, not only was she coming out to Africa but enduring two weeks with the expedition. I was a little worried at what she would find. She would be a new species in an ecosystem that had taken a long time to evolve and equilibrate. The three core members of the expedition had been on the road since the beginning of October. We were into our twentieth country, un-separated from our vehicle or each other. Those clean cut, Cornish doctors had become a tangle of uncut hair, moustaches, running jokes and complex systems. Every position and aspect of the car had evolved a name; we practically spoke a different language when driving or packing. We were probably a little too comfortable with crowded, dusty streets, the intensity of arriving in every village as a celebrity and day after day of bush camping. I had time to down a couple of superbly strong Ethiopian coffees before we drove to the airport. I managed to fit a dramatic passport loosing-finding fiasco into the hour we had to wait for the internal flight. Megan arrived. During the excited greeting, she disguised her reaction to the state of Tess and us expertly. She was able to catch the last big day of processions and celebrations. The following days were spent preparing for our onward journey and waiting for Megan’s bags to arrive. They had probably gone through more countries then the expedition. In her luggage however was an Aladdin’s trove of marmalade, marmite, letters from loved ones and single malt without which the expedition would have certainly ground to a demoralised halt. The city returned to relative normality, Dan stayed in his tent in a shady spot in the garden, exhausted by his malady. He would only whisper faint acknowledgments of our presence during the day. By night, he would babble, laugh or cry-out in primal terror at whatever fever-fueled illusion taunted him. Meanwhile, I had by the skin of my teeth avoided betrothal to a daughter of a powerful Gondar family. Just as the situation was really escalating – having met the mother, brother, sisters and stern, three-piece-suit wearing father – I was dumped, apparently due to my unpredictable future plans and non-committal behaviour. It was time to leave. As I have said before, the Great Rift Valley, that runs the spine of east Africa, has some pretty serious geography going on. 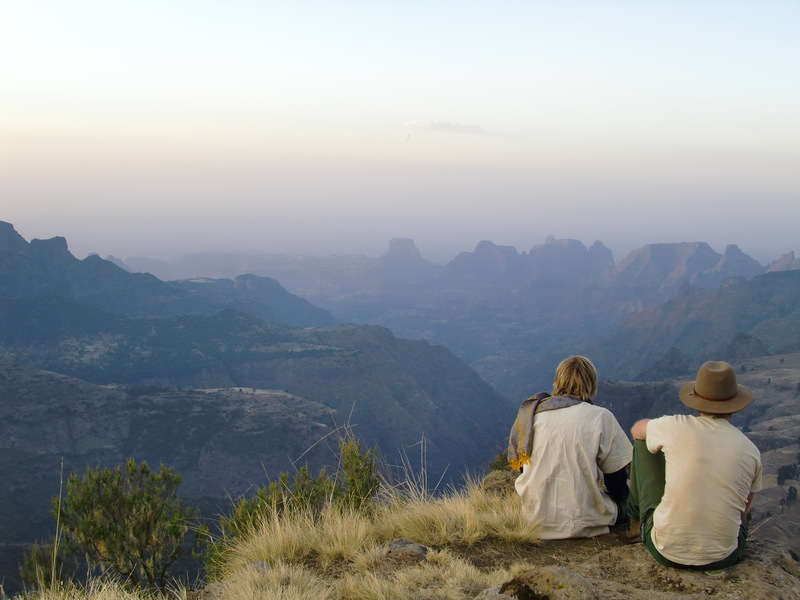 The Simien Mountains are where the Rift Valley is at its riftiest/most-rifted/riftigenous; the bigger brothers of all the other Ethiopian mountains; ‘The Playground of The Gods’. Most amazing is how the land here plunges in great folds down to bellow sea level in the volcanic Danakil depression. Our venture into this lofty playground had a few ill-fated turns. As we had our own car, we thought we could keep costs down and only hire a scout, without taking a guide. All of the scouts are old war veterans who fought against the Derg and were allowed to keep their guns. The scout we picked up was an ancient, arthritic soldier who spoke no English. 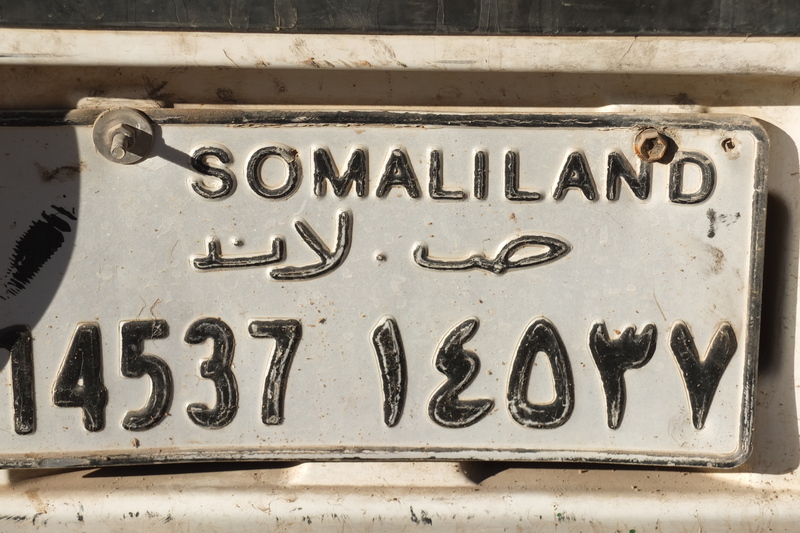 We spent a chilly night in Debark, the last town, before setting off early the next day. Our car was a modest six with the scout, Megan and Bob, whose bike we strapped to the roof. A few miles out of town we took a steep track that fell off the edge of the range. Although we had started above 3000m, we all had a nagging feeling about heading down several monumental cliffs, rather than up into mountains. However there didn’t seem to be another road and our scout sat peacefully in the front, as one would expect from a man going along his usual route. After four hours winding down rocky paths only really fit for mules, we had a puncture. As the countless, would-be assistants melted out of the landscape to stare at us changing the wheel, I craned my head up at the wall we had dropped down. I thought I’d better just check with our guide. He tried to escape the conversation when I asked for the name of our destination but I noticed him flinch in realisation at ‘Sambikir’ the name of the first camp. He shrugged his shoulders and made an elaborate show of shooing away the locals with a pointed AK47, as if to highlight that he was a guard, not a guide. This façade of ignorance was fooling no one. He caved under further interrogation to reveal that despite being only a few miles as the crow flies from our ultimate destination, a couple of those miles were vertical. We would have to go back to the beginning. This marked the start of a time I would like to call ‘the flat tyre era’. The rest of the day was spent with the five of us (plus gloomy scout) crammed inside Tess, climbing back up to the start. It was dark when we limped into camp. We had salvaged some of the day by finding and following a thousand strong troop of Gadella baboons, the largest and most peaceful of their kind. We had also endured a further puncture, using up our second spare. We found the Swiss camped in a grassy clearing overlooking a sheer valley. Over supper they told us that they wanted to leave their car hidden in the mountains in order to trek away from the road. 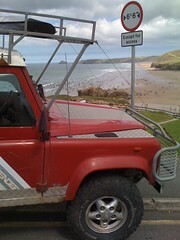 They asked us whether we could find it and drive it on to the third campsite, where they would pick it up a day later. We readily agreed. The plan seemed flawless. The following morning we awoke to find golden sunlight kissing the peaks and Tess listing over a third flat. Our Toyo all terrains that we had bought second hand on e-bay had held up well until now, but seemed to be failing on the rough mountain roads. Rich decided to attempt fixing the tyres in the bush and look after Dan. Meanwhile I would take a trekking party of Megan, Bob our confused scout to see the waterfalls. We would try and locate the Swiss’ car (a day’s walk ahead) then await the Landie before heading in convoy deeper into the range. Over breakfast, as if to mark an omen, a Black Kite circled, then dive-bombed Megan as she prepared breakfast, making off in a hiss of feathers with a doughnut in its talons. The morning’s trekking was deifying; worthy of a power ballad. We walked along the edge of oblivion, tumbles of highland, tiny farms, houses and soaring eagles all miles beneath us. By lunchtime we were at the waterfall, a great granite cleft, disappearing into the shadows of the mountain it had hewn. Tiny, we peered into empty air. 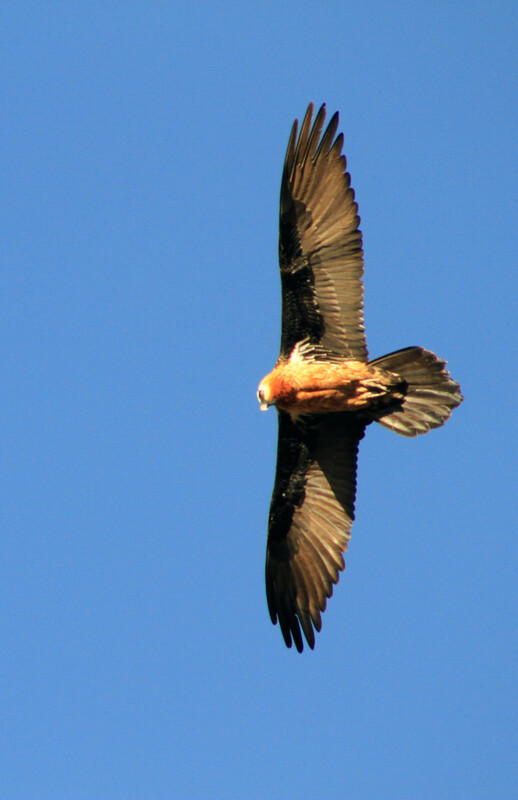 The sun caught the backs of rising vultures. Neither sight nor sound could be glimpsed of the bottom. We trekked on to the road to wait for the support vehicle and eat a modest lunch of Samosa roulette. By three, we were faced with difficult decision. The car had not arrived and was probably back at first camp. The Swiss-mobile was hopefully a few hours up the road. Our bag only had a few jumpers and a coup of water bottles. We decided to take a gamble on the support being close behind and to push on and up to find the car. As long as we stayed on the road, we couldn’t miss Dan and Rich. We trudged for a further two hours along a high plateaux and past a village, gaining altitude all the way. There was still no sign of the car. Our guide, who seemed to be suffering, was becoming very anxious as the shadows grew longer and a sparse mountain chill began to bite our sunburnt cheeks. It wasn’t really possible to explain our complicated plan to the scout, only keep repeating the name of the point Dario had hopefully left the car. Worryingly, his directions kept changing. We had to keep going. By six, we were tired and hungry. I was silent with worry. Over each horizon we would scan with binoculars for the silver of a hidden vehicle before heading to the next viewpoint. There was no sign or word from Rich, Dan and Tess. Finally, as the temperature was really dropping, we spied the car. The group of locals who had been paid to watch it were alarmed when a trio of farangis marched across their field and fell upon the car, ravenously ransacking the vehicle for food and warm clothes. We had no choice but to drive the final ten miles to Debark (the third camp). The road was extremely treacherous and it was my first time in a left hand drive car. Our poor scout wisely did not release his white-knuckled grip of the handrail for the whole journey. After navigating several precipices we rolled into the final camp. The low light was electric pink. Ravens and vast Lamergiers swooped and crowed around the cluster of buildings. Otherwise the thin air was silent. We watched sunset with an eagles’-nest panorama. The high mountain moors were wild and cold above us. 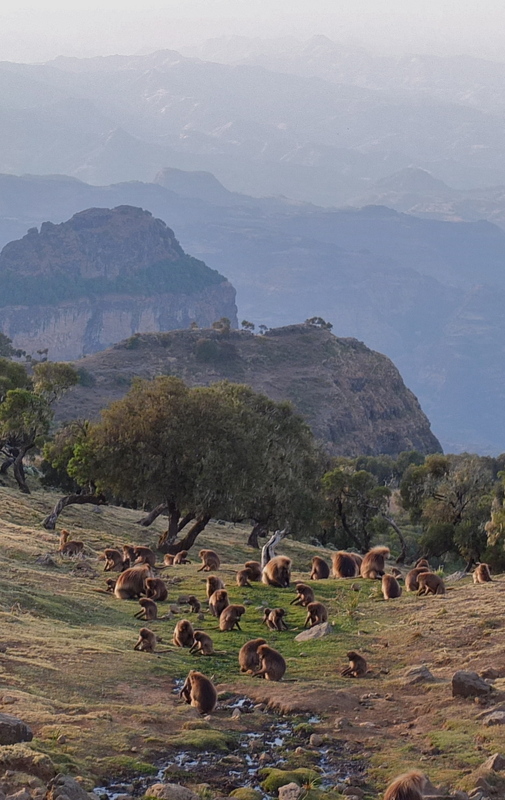 The song of the Simien wolves drifted just beyond recognition. That night we spent our meagre funds on a hot meal. We had no warm clothes and no sleeping bags. The car had a roof tent, a towel and a thin blanket. Temperature dropped to around minus five as we huddled together for scraps of sleep. Meanwhile, Rich had been thwarted by a series of cheap Chinese pumps, which broke in quick succession. He was forced to hitchhike back to the town, rolling two wheels to be repaired. He salvaged his situation somewhat by infiltrating the dinner of a Belgian tour group and charming their daughters. Dan spent the night alone in the wilderness with just his delirious nightmares for company. Our delivery complete Bob, Megan and our broken scout were forced to hike back until we could flag down a vehicle. We eventually jumped into a road builder’s truck filled with the mountain’s commuters. In the trailer we held on to wherever we could as the driver accelerated around sheer-sided corners with complete disregard for potholes or his suspension. Megan, Bob and the scout kept their heads wisely inside the trailer bed. We had all seen the skeletons of trucks and holes in the barriers that mark out the Ethiopian roads like milestones. Bob had even witnessed the last expressions of a mini-van full of passengers as they left the mountainside on two wheels. I remained standing and planned how to jump out and roll, were we to go over. Today the driver had prayed sufficiently and we arrived back at Tess to be reunited with the complete team. 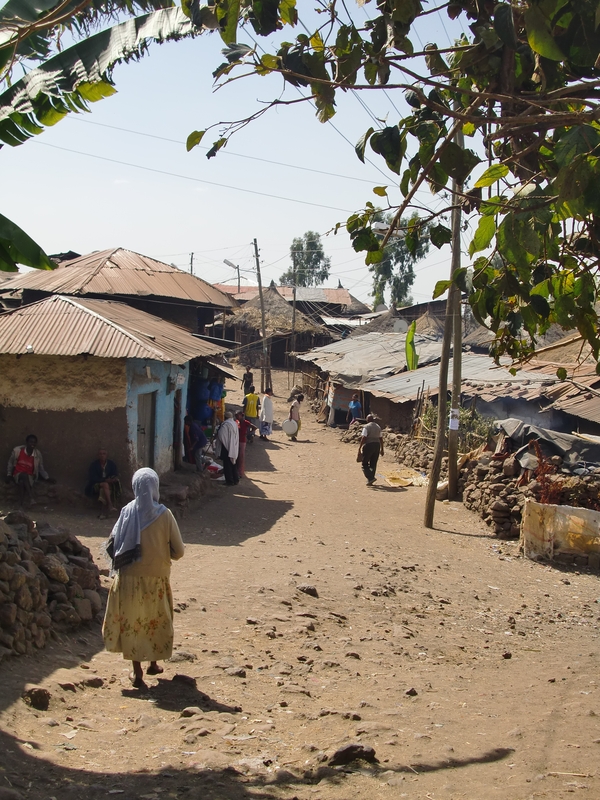 We headed back to Gondar to recover.